Hi everybody, I’ve put this here for everyone to see, but technical problems arose with the transfer of the document so there are no photos in the newsletter and the headings are not as consistant as they should be…. I’ve emailed this Newsletter to the Member List I’ve got, but I’m not sure everybody is on there. If you would like the complete copy of this Newsletter just email me and ask for your name to be put on the mailing list. You don’t have to be a member, but please consider joining to help support us, membership can be submitted on paper or with a few clicks right now on the computer. What: Workshops on: basic Permaculture design, composting, monsoonal veges and herbs, seed raising and planting, etc. Cooking demonstration(s) and BBQ (meat and vego selection) by gold coin donation. This meeting at JCU is going to be a morning of diverse activities. I (Leon) am putting out a request that any of our members who would like to share their skills and/or knowledge on a certain topic; to please phone or email me (see ‘Management team’ section at end of Newsletter) – expressions of interest in any topic relevent to Permaculture in Townsville are welcomed. Workshops: I hope we can get the whole group (up to a maximum of 45) to do one or two activities and then separate into smaller groups for a range of workshops. I think it would be best to have a single instructor for each workshop, but they should be supported by at least one other PcT member (it really makes a difference, when you have a collegue to bounce ideas with and it also helps when stuck in explaining a concept to provide different descriptions or interpretations – two minds working together are greater than the sum of their parts). Raffle: Because this PcT meeting is being attended by many people not from our group, I think we should bring along some extra goodies, making sure everyone with a ticket can take at least one prize home. It will also stimulate more interest in those unaware of what we do, to see the abundance and generosity of our group. Lunch: A BBQ (or two) is being provided by JCU, and we’ll be cooking up lots of fresh foods and hopefully some local stuff that people bring along. I’ll look into sourcing relatively local and ethically raised meats for the carniverous among us. All members are encouraged to bring something along to share for the lunch (feel free to bring things like salads, sandwiches, crackers and dips that don’t require cooking and please label whether there is meat in it or not). If you’d like to provide a cooking demonstration (conceivably as a ‘workshop’ because its fundamentally a part of Permaculture), please contact me and we’ll get it all organised. — THANKS! Leon van Wyk was elected as our new Secretary, Diana has remained as Treasurer and I will remain on as President for a final year. 2011 is shaping up to be a very interesting year for Permaculture Townsville Inc (PcT). The focus for this year is on education and more involvement with the broader community. We have the opportunity to form a robust partnership with James Cook University (JCU), by becoming integrated into the TropEco sustainability program being launched in February 2011. This may lead to enhanced collaboration between PcT and several like-minded groups in the region, eg Food for Thought, NQ Dry Tropics (natural resource management group), Beekeepers Association, Herb Society of NQ, Seed Savers Up North, etc. The TropEco program is being launched early this year and is JCU’s primary means to improve its environmental performance; AND educate students and staff to reduce theirs personally. Becoming an integral part of TropEco will prove very rewarding for PcT and JCU, and will provide the foundations from which Permaculture can be demonstrated as a method of Sustainable Development. A proposal for a Community Garden (in the JCU grounds) has been submitted; nursery facilities and possibly storage/support for a local seed bank; along with functional food forests being established throughout strategic points of the Townsville Campus, are some of the potential projects being evaluated. PcT’s first event of the year is a Working Bee/Workshop at the Student Garden at JCU Rotary International House — on Saturday 29 January from 8am till lunch, yes it is an early start but feel this necessary considering the weather. This event is a collaboration between JCU, NQ Dry Tropics and PcT. The garden has been productive for over 10 years, but due to the holidays and monsoonal whether it’s certainly in need of some TLC. This event will involve a little manual labour for those who would like to help with some weeding and clearing of the site along with workshops on various subjects, eg design, plant identification, seed-raising and planting, composting, etc. Please RSVP if you wish to attend or if you wish to organise/be involved in a workshop or indeed help out in any way. I would love to have as many PcT members as possible on hand to answer questions and pass on their knowledge to new comers. As of Wednesday, there were about 30 people on the RSVP list (mostly non-PcT members who are coming along to learn). Don’t feel that you need to man a pick and shovel to attend as there will be plenty of activities that will not require manual labour. As always please bring gloves, hat, sunscreen, water, chair, plate of something to share and something for the raffle. Check the website for all the details – a reminder will be emailed closer to the day. This is just the start of what is shaping up to be a very informative and enjoyable year. Along with meeting/workshops with other like minded groups we will continue to hold many informal meetings at members’ homes. If you have suggestions for events/workshops you would like to see on the 2011 calendar please contact one of the committee members. Greetings all, I’m proud and excited to have been appointed as the Secretary for Permaculture Townsville (PcT) for 2011. My name is Leon van Wyk, and I’m fully motivated to help grow PcT’s reputation and influence in the community; by coodinating new initiatives and forging productive partnerships within Townsville and the surrounding regions. First things first, I’ll give an account of the AGM, which was held at Trish Cramer’s place out by the Ross Dam, Kelso on 21 November 2010 – a big thankyou to Trish and Ross for their hospitality. The AGM was opened and all committee positions were declared vaccant, Dianna was nominated as Treasurer once again and Trish was nominated as President for another term; both were seconded and took their roles respectfully. Murray Whiley, the previous Secretary, was keen to nominate me for the Secretaryship, I had no objections and the nomination was seconded; thus I became the Secretary of PcT for 2011. Blake Hudson was also restablished as the Editor/publisher for another year. There were no major issues to discuss further, so the AGM was closed and then we opened a General Meeting to hear many ideas on a variety of topics. First voiced, was Trish’s exclaimation of the need for PcT to have a stronger ‘community outreach component.’ Which, it seems everybody present agreed with, and a lengthy discussion ensued. One of the main points from that was the idea of having more public events (rather than just a monthly meeting where we might tour a garden); as well as actually facilitating educational events. In an attempt to develop a better understanding of Pc in the individuals who attend our meetings specifically to learn about Pc. The way I see this, is that there seems to be a propensity to avoid dealing with money, because our group incourages sharing of surplus and the values of non-competitve, community based, localised and low impact trading. While these are very important aspects to us as individuals and especially crucial to the continuation of our group — it does not mean we should avoid the use of money altogether. Merely we should, where possible, use other means to trade or better yet gift, but it does not exclude the use of money altogether. Therefore, if we wish to organize local activities and coordinate events that are significant in expanding the understanding of Permaculture; we mustn’t be afraid of dealing with money. What I understand, is in the past all of our members were too busy to take on extra responsibilities, so nobody could spare the time and/or resources to coodinate events on a regular basis. While we should be redistributing the surplus, it does not mean making sacrifices that your uncomfortable with. When we don’t have surplus time and energy, we need to charge a fee, so that it becomes worthwhile. In doing so, we gain benefit from organising a positive and hopefully effective activity in demonstrating: earth care, people care and fair share – the three ethics of Permaculture. Secondly, and I’ll be brief from here onwards, the fact that May is the ‘month of learning’ for Citi Libraries, and we might be able to approach the authority and get a Pc component in their month of activities and showcasing; and I have no doubt they’ll try to have some sort of coverage of ‘green’ things to do and learn. So we could definitely help them out tremendously in that regard. Thirdly, Blake mentioned that the Pc group in Cairns were successful in a grant application for a video camera and projector… which they are now using to film events for their own records and to publish promotional and instructional videos on the web, as well as holding film nights. After hearing that piece of info, I moved a motion that PcT should evaluate the the possibility of our group attaining a video camera and projector. Penny Claringbull committed herself to investigating the opportunities of Townsville City Council’s grant scheme. Jill Weil moved the motion that we look into getting clothing for PcT, not necissarily a uniform, but clothes that idetify us either with Pc in general or PcT specifically. Here I mentioned that at the APC10 in Kuranda, Pc Cairns had arranged the screen printing of many, many second hand T-shirts with Pc logos, slogans, pictures, etc and sold them for $20/shirt generally – they also did dresses, singlets, sarongs, etc. Murray raised the issue of gaining a (relatively) permanent venue for PcT to be based. Whether it’s just a meeting room or a designated piece of land with a building exclusively for our use… the details are open for discussion, but the everyone present thought that it would be good to have a single location for meetings – so long as we maintain having some meetings/raffles/tours in a diversity of local backyards. Lastly, Rod has enquired about wether PcT should hold a seedbank of plants adapted to the local environment and over time it would become a locally replenished and therefore ‘Townsvillian’ seedbank. He has suggested that if nobody else wishes to manage it, he is willing to act as coordinator. Before I wrap up, I’d like to make a call for any items you wish to discuss at the next meeting. I’ll be composing an Agenda for each meeting, so please email or call me to communicate any thing you feel we need to be aware of or decisions we should make at least 24hrs before each meeting. So that is that. I welcome you into the new year and I’m sure Permaculture Townsville will showcase its prowess in community outreach through its demonstration of truly integrated sustainability. May you gracefully seed gems of Permacultural wisdom into the minds and lives of many Townsvillians. We’re going to start a register for recording each of our members’ contributions to Permablitz’s, so that once you’ve participated at least 3 times, you’re eligible to apply for a Permablitz at your place! I think it seems fair to start that process at the upcoming meeting because we will be doing so much hands-on activity. Those members who participated in the Permablitz at Blake’s (1 Cabot st) in April 2010, will have one credit to start with on the register. 3. sand pallet base now in place with the fire bricks all level and packed in. 7. shaping the doorway, as you can see there is no chimney, the height of the door is 63% of the total height of the mould to allow the smoke to escape out the top. 8. Now with the doorway edging all done and a rain cover we left it dry for 3-4 days before hollowing out the sand. If anyone has any questions please email us and we’d be happy to answer any. Massive credit to Chancey the project leader and to all the awesome helpers that spent time playing with mud! Wash, skin and chop cassava into small pieces, be careful to not include any stringy parts. Place Cassava in large pot and boil until soft. Fry onion in a pan till golden then add chopped pumpkin tips, coriander leaves and vegie stock, cook until soft, set aside. Peal garlic and slice chilli and quickly fry in a pan for a couple minutes to release flavour; then place into mortar and pestle and crush. Drain Cassava, Add garlic/ chilli mix and pumpkin tip & onion mix to the large pot then mash with potatoe mash, or possibly a bar mixer could be used. Range S: S.E. Asia – Himalayas to China and Vietnam. PERENNIAL growing to 2 m (6ft) by 1 m (3ft 3in) at a fast rate. The plant prefers light (sandy), medium (loamy) and heavy (clay) soils and requires well-drained soil.The plant prefers acid, neutral and basic (alkaline) soils..It cannot grow in the shade.It requires moist soil. Woodland Garden Sunny Edge; Hedge; North Wall. By. West Wall. By. Fruit – raw or cooked. A delicious aromatic taste, somewhat like a cross between a pineapple and a strawberry. The fruit is best eaten raw but it can also be made into pies, cakes, puddings, jams, jellies etc. Fruits can suffer damage from autumn frosts, though the flavour develops better at low temperatures. The fruit is up to 7.5cm long. Flowers – raw. The petals are sweet, crisp and delicious, they taste more like a fruit than many fruits. They should be harvested just after they begin to soften. Young leaves and shoots – cooked in soups[183, 272]. Used as a vegetable. The leaves are also used to clarify sugar. Unripe seedpods – cooked as a vegetable in much the same way as okra (A. esculentus)[183, 238, 272]. Seed – cooked. It is fried or roasted and has a flavour similar to sesame seeds. The seed is also used as a flavouring for liqueurs or to scent coffee[183, 238]. An essential oil is obtained from the plant and is used to flavour baked goods, ice cream, sweets and soft drinks. Root. No more details are given, though the root is likely to have a bland flavour and a fibrous texture. An emulsion made from the seed is antispasmodic and is especially effective in the digestive system[4, 238]. The seeds are also chewed as a nervine, stomachic and to sweeten the breath[4, 238]. They are also said to be aphrodisiac[4, 238]. 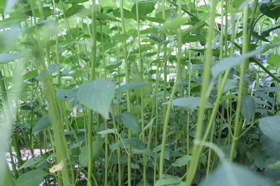 The seeds are valued medicinally for their diuretic, demulcent and stomachic properties. They are also said to be stimulant, antiseptic, cooling, tonic, carminative and aphrodisiac. A paste of the bark is applied to cuts, wounds and sprains. The essential oil is used in aromatherapy for the treatment of depression and anxiety. It is also applied externally to treat cramp, poor circulation and aching joints. Easily grown in a rich well-drained soil in a sunny position. Tolerates a pH in the range 6 to 7.8. This species is not hardy in the colder areas of the country, it tolerates temperatures down to about -5°c and can be grown outdoors in the milder areas of the country. The plant grows as a shrub in frost-free climates but is usually cut back to the ground in British winters. So long as these winters are not too cold, however, it can usually be grown as a herbaceous perennial with new shoots being produced freely from the root-stock. These flower in the summer. It is probably wise to apply a good mulch to the roots in the autumn[K]. It is best to cut back the stems to about 15cm long in the spring even if they have not been killed back by the frost. This will ensure an abundance of new growth and plenty of flowers in the summer. The musk mallow is widely cultivated in tropical climates for its many uses. There is at least one named form, selected for its ornamental value. ‘Mischief’ is somewhat smaller than the species, reaching a height of 50cm. Seed – sow April in a greenhouse. The seed germinates best at a temperature around 24 – 24°c. When large enough to handle, prick out the seedlings into individual pots of rich. Looking for either young chicks or ready-to-lay. Preferably individuals that LOVE to scratch a lot! Because I’ll be raising them in a deep litter system, which makes them an integral component to my composting processes. Anywhere from 2 to 5 individuals would be great; payment to be negotiated. *EDITOR’S NOTE: please submit your for-sale items, donations and/or wish list of wanted goods and services to the PcT team (by phone, email or post). They will be posted on our website as well as in our Newsletters. We’ve crafted a calandar of events that PcT will be faciliatating or attending, throughout 2011. It’s in the form of an Excel Spreadsheet and is available to all members. We will also keep an updated calandar on the website (yet to be revealed), so that you can find out whats on but also what’s been called off or postponed. If we email out the calandar, it will not stay up-to-date; therefore not as useful as possible. Emails will be sent out to notify everybody of any changes to the calandar, so you could choose to keep it updated manually (strange how that term is appropriate in this context). Feb 16 – Market day at JCU in O-Week. PcT to occupy a stall in the sustainability section. TropEco getting formally launched by Costa Giogiadis (on behalf of PcT), from the SBS program “Costa’s Gardening Odyssey.” He’ll be attending with PcT. Feb (mid-late) – Workshop by Rob and Julianne from Bamboo Solutions in FNQ. Selection of workshops from propagating, managing, harvesting, crafting bamboo, to multiple functions and relative location of bamboo clumps (learn about many different varieties of bamboo too) in Permaculture systems. They could return periodically and deliver each one of these workshops. TBA – A group tour to The Botanical Ark [ http://www.botanicalark.com/ ] a 27yr permaculture food forest process that regenerated (multi-functional) rainforest cover to 8Ha of an exploited and degraded valley. Renewable energy systems, botnical quarrentine station, a huge diversity of endangered rainforest species, etc. Just outside of Mossman in the Daintree Rainforest, FNQ. TBA – Alan Carle, founder of The Botanical Ark to give a presentation in Townsville, accompanied by slideshows of stunning photographs he’s taken from all the world’s tropical rainforests; on his expeditions over the decades. He’ll describe the process of their Permaculture system in the Daintree and also speak on the broad relevance of Permaculture to our society and the planet. TBA (Feb/March) – Cecillia Macaulay [ http://ceciliamacaulay.com.au/ ] from Melbourne (lives half the year in Japan, teaching Permaculture in both locations) to present her unique exploration into Permaculture at the very small-scale systems (balcony’s and the like, but also within your refridgerator, wardrobe, living room, shed, etc) with a focus on aesthetically pleasing designs. Also, the way to apply Permaculture principles to your relationships with others – that’s permaculture applied to the dynamics of the relationship itself, not just ‘you’ or just ‘them’ (or ‘that’), but the betweeness itself. May (1st weekend) – Permaculture Day! An annual event that is being acted upon internationally! Lots of small events of Permaculture relevance throughout the city, or maybe one large event running all day with music and festivities (would need to collaborate with some other groups to make it very dynamic, diverse and attractive to a wide range of people). May – is also the ‘month of learning’ by Citi Library; perhaps link in with Permaculture Day. June – Palm Creek Folk Festival, same as above (but different). October – Rupertswood ‘Living on acreage field day,’ PcT to attend with stall. November – traditionally the time for PcT to have its AGM. As you hear of events or groups of interest, please let us know. Don’t forget to checkout our website permaculturetownsville.org and follow the links. 2011 MANAGEMENT TEAM – Permaculture Townsville Inc.
Committee membership is open to any payed member who would like to assist the group.